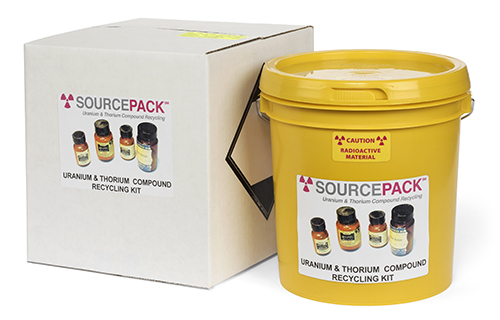 The SourcePackSM is a one-of-a-kind recycling kit is designed for shipping uranium and/or thorium chemical compounds that are DOT class 7 and have a subsidiary DOT division of 8. Typical compounds include corrosives such as uranium/thorium metal analytical standards digested in nitric acid. The SourcePackSM kit is designed to qualify as a DOT limited quantity package for the chemical DOT class shipping as: UN3264, Corrosive, Liquid, Acidic, Inorganic, n.o.s., 8 (7), II. The kit has a design capacity of one pound for labeled weight of uranium and thorium oxidizing solids. Pricing is for any location in the lower 48 United States.